Rosa arvensis flore pleno is most likely a double, so-called Ayrshire form of the ‘Field Rose’, although from the information provided it is not possible to identify it further. ‘Branches four or five yards long when led over a trellis, and therefore well suited for covering arbours, smooth, but armed here and there with hooked prickles. Leaves generally consisting of five, sometimes only three, very rarely seven leaflets, which are ovate, acute, sharply serrate, the terminal one larger than the rest: petiole armed with a few curved prickles, otherwise smooth. Stipules semisagittate conjoined. Flowers in terminal corymbs. Peduncles covered with glandular hairs, with two or three lanceolate, entire, pellucid bractes at the base of each. Germen oval, smooth; segments of the calyx entire, awned, a little hairy. Petals white, obcordate. In these characters we cannot find any thing to distinguish this plant from Rosa arvensis; the extraordinary length of the branches being probably solely owing to culture. It has been known some years in our Nurseries, under the name of the Ayrshire Rose, but upon what grounds it has been so called is difficult to say, for upon the strictest enquiry, as we are informed by Sir Joseph Banks, no Rose of the kind could be heard of there or in any part of Scotland.’ [BM t.2054/1819]. The double field rose is probably very similar to Rosa arvensis ‘Splendens’, still available today. This is a vigorous climber with dark green leaves and purple-red buds opening to loosely-formed, cupped, double, myrrh-scented, pale creamy-pink flowers in summer. Rosa arvensis is said to have been introduced to England from Turkey about 1750  but this may be confused with another rose. Thomas Rivers describes the vigorous ‘Double White Ayrshire’ rose, a semi-double variety with pure white flowers which will often make shoots of twenty to thirty feet in a season. [Rivers (1854, 1857, 1863)]. This appears to be one of the roses with extraordinarily long branches referred to in the Botanical Magazine. Catherine Gore lists Rosa arvensis rosea plena, with medium-sized, very double red flowers, usually borne in threes. [Gore]. 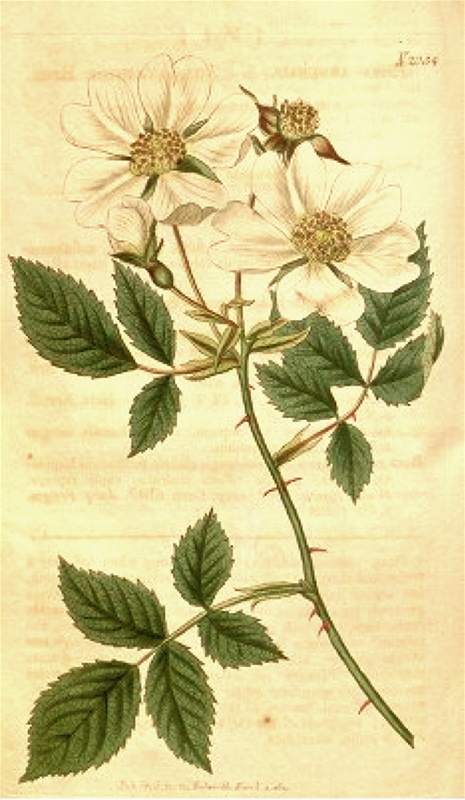 George Don, in his General System of Gardening and Botany suggests that Rosa arvensis flore pleno may be the same as Lindley’s variety hybrida [Lindley Rose 113], called by Gore the ‘Hybrid Field Rose’. He describes it as being many-flowered, sweet-scented, the flowers being semi-double and a delicate flesh colour. It was called the double-hip rose in the nursery trade. Also described by Paul (1848, 1863, 1888). Listed in all catalogues as Rosa arvensis pleno or fl. pl. and described as double field rose in the 1843 and 1845 catalogues [T.835/1843]. Plants of ‘Rosa arvensis pleno’ were presented to the Sydney Botanic Garden on October 24th 1846 [RBGS AB]. Rosa arvensis Willd. var. flore pleno | BM t.2054/1819 | BHL. The single rose is figured.